I arrived at my place of employment this morning to the sounds of dripping water and visions of soaked books. Apparently our roof has been leaky since the building, but rather than replace it the county has been repairing it piecemeal for years. Last week another crew came in to “fix” the roof and after some significant overnight rain the section above the reference area finally gave up the ghost. 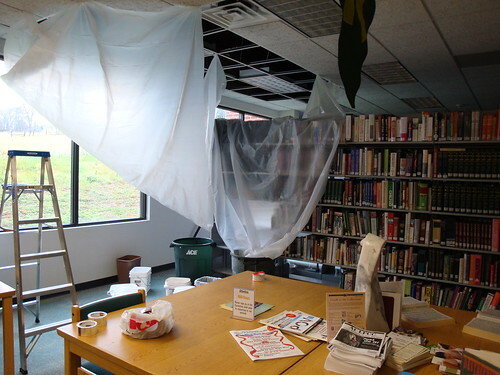 At least the torrents of water missed most of the super-expensive reference books. Our Civil War collection was not quite as lucky. Not a pretty picture. I envision hoardes of bemoustached library patrons being less than understanding…. And now for the joke (sorry): You can take comfort in the fact that, Conan, the South will rise again. Water and books, it’s no good.